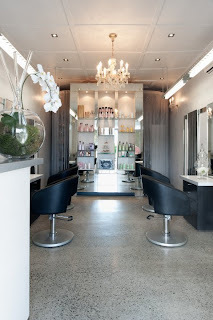 Earlier this week I took a trip over the Harbour Bridge to a small-but-perfectly-formed salon in Birkenhead Point called Biba. Owner Belinda Watson has created quite the oasis in her beautiful boutique salon, and just walking through the door felt like a right treat! After I placed an order for their ginger, lemon and honey signature tea – served with a side of homemade tahini balls – I had a consultation with Belinda about my reason for travelling over: to try the newest version of INOA colour. Back in 2010, L'Oréal Professionnel launched the revolutionary colour experience with an Oil Delivery System (ODS) known as INOA, and I was one of the first in the country to try it out. I was immediately impressed by the fact that it was ammonia and odour-free, and the end result was pretty damn good too. Fast forward to 2012 and INOA has been reformulated to deliver even more performance, with the new technology boasting low levels of alkaline agents resulting in optimal respect for the hair while maintaining maximum colour results. The new baby works by fusing colourant and oleo gel into a two-step process which makes it simpler and easier to use, and it still delivers the same odourless formula with optimised scalp comfort, sublime shine, ultimate respect for the hair and great colour results. Belinda tells me that it also delivers six weeks’ worth of intense hydration and nutrition, and leaves hair feeling softer and shiner than before the colouring service. One look at my ratty ends and I seriously disputed that last claim, but I happily sat back and enjoyed the rather luxurious Biba experience anyway, only looking up once my blow wave was almost complete. What I saw was a serious load of shine on my rather worn out looking locks, and - incredibly – it extended right to the tips! It also felt incredible all over, and the edges of my balayage-style colour were beautifully blurred for the first time. It looked bloody amazing, even if I do say so myself! The biggest test however was this morning, when I washed and blow-dried my hair post-Biba for the first time… and the shine and the softness were still there. Amazingly, the already damn good INOA has got even better – and my hair just soaked all the goodness up.